On Saturday, October 1, the much anticipated TEDx Academy 2016 took place in the beautiful building of Megaron, the Athens Concert Hall. The annual event has come to be synonymous with thought-provoking dialogue, inspiring speeches, and a creative platform nurturing innovation and the exchange of ideas. This year’s talks centered on the theme “Re-imagine Greece” featuring 18 distinguished speakers, among whom was Dr. David G. Horner, President of The American College of Greece. 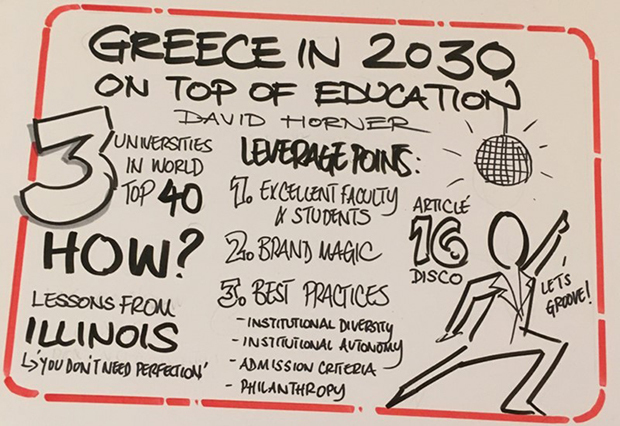 Dr. Horner spoke to an audience of over 1,400 people in the second session of the day, titled “A Letter from the Future: Greece in 2030” sending an optimistic – yet achievable – message from our future reality. After a brief and witty look into his family past, Dr. Horner unfolded his vision for the future through an inspiring, hopeful, and optimistic letter from 2030 that paints the picture of a very different Greece. By 2030, the country learned to effectively leverage two of its strongest strategic assets, “excellent human capital and brand magic,” becoming an international center for education, with three Greek universities in the top 40 universities of the world. The specific mention of three universities is based on Dr. Horner’s long experience as president of a university in Illinois, a state with the same population as Greece, that faces similar economic and political dysfunctions; yet, Illinois has three universities in the world’s top 40. “Illinois is proof that you do not need a spectacular economy or a perfect political system to develop world-class universities,” said President Horner, suggesting that US “success stories” can be Greece’s way to a brighter future. President Horner was warmly applauded for his ability to show the audience a very hopeful, but plausible future for Greece. As a true orator, he saved the best for last… Enjoy the full speech!